Five years after the housing market collapsed, California’s economy remains weak. The unemployment rate is nearly 10 percent, twice what it was in 2006, and in 2012 the State’s underemployment rate averaged an astonishing 19.3 percent.The continuing housing crisis remains a key cause of this widespread economic tragedy. Nearly two million California homeowners are underwater, owing more on their mortgage than their home is worth. Five years after the housing market collapsed, California’s economy remains weak. The unemployment rate is nearly 10 percent, twice what it was in 2006, and in 2012 the State’s underemployment rate averaged an astonishing 19.3 percent. The continuing housing crisis remains a key cause of this widespread economic tragedy. Nearly two million California homeowners are underwater, owing more on their mortgage than their home is worth. Since 2008, banks have foreclosed on approximately 1.7 million homes in the state. Right now, around 65,000 California homeowners are in the “foreclosure pipeline” – they’ve received a Notice of Default or a Notice of Trustee Sale. Every day, more and more families get added to this list. Wells Fargo is the biggest mortgage service provider in California, responsible for nearly one in five of these impending foreclosures. 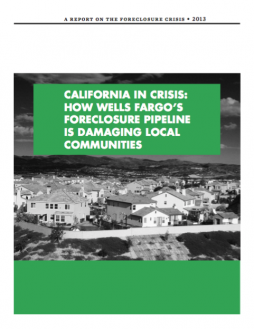 This report shows the tremendous damage that will befall California’s communities if Wells Fargo continues to foreclose on so many families. Five years after the housing market collapsed, California’s economy remains weak. The unemployment rate is nearly 10 percent, twice what it was in 2006, and in 2012 the State’s underemployment rate averaged an astonishing 19.3 percent. Millions of Californians are struggling to make ends meet. The continuing housing crisis remains a key cause of this widespread misery. Nearly two million California homeowners are underwater, owing more on their mortgage than their home is worth. This tremendous mortgage debt is severely crippling the State’s economy by holding back consumer spending and preventing a robust recovery. And the mortgage debt is devastating the lives of too many Californians. Since 2008, banks have foreclosed on approximately 1.7 million homes in the state. Right now, about 65,000 California homeowners are in the “foreclosure pipeline” – they’ve received a Notice of Default or a Notice of Trustee Sale. Every day, more and more families get added to this list. Government tax revenues would be cut by $20 million, as a result of that depreciation. Every month, more homes fall into the foreclosure pipeline, compounding this disaster. The foreclosure crisis has hit African-American and Latino borrowers and communities particularly hard. The pages below highlight the concentration of distressed loans handled by Wells Fargo that are in African-American and Latino neighborhoods. These communities have already suffered tremendous wealth loss due to the recession and this report shows that far more harm will occur in the coming months unless Wells Fargo changes its policies. But Californians do not have to accept this bleak future. Economists and policy experts across the political spectrum agree that an alternative approach to the housing crisis can be a win-win-win for homeowners, mortgage holders, and California’s economy. As this report explains, widespread modification of home mortgages to current market value would prevent tens of thousands of needless foreclosures, inject billions of dollars into the economy, create hundreds of thousands of new jobs – and would even be in the financial interest of the investors who own the mortgages. Wells Fargo is a pivotal actor in determining whether principal reduction becomes a widespread solution. Its failure to lead on this issue is clear. The most recent report from the national monitor of the multi-state Attorneys General mortgage servicing settlement shows that in California, Wells Fargo is providing far less principal reduction than Bank of America, despite the fact that it services more loans. The solutions are clear: Wells Fargo should (1) commit to a broad program of principal reduction, (2) be honest with Californians by reporting data on its principal reduction, short sales, and foreclosures by race, income, and zip code, and (3) immediately stop all foreclosures until the first two solutions are implemented. After years of predatory lending and heartless foreclosures, it is time for Wells Fargo to stop. Stop the needless foreclosures. Stop the needless evictions. End this housing crisis.